The towering reddish-brown wall of dust that descended on Lubbock from a clear blue sky last October transformed the city’s sunny streets into a ruddy, twilit tableau in a matter of minutes – a spooky sight not often seen in West Texas since the Dust Bowl. 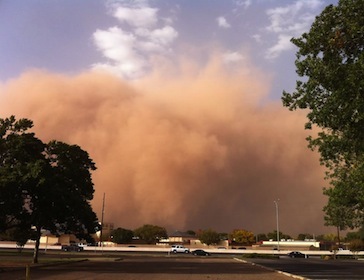 The intense dust storm (a haboob, in meteorological parlance) came amid an epic drought that has parched the South Plains and much of the rest of the state for months, driven by a persistent La Niña weather pattern in the Pacific Ocean. An unusual combination of winds picked up a loose layer of desiccated soil and swirled it aloft, creating a dense cloud of dirt that coated homes and yards. If the summer of 2011 is any gauge, people living in Lubbock in 2050 will regularly experience more challenging conditions. As last summer’s drought wore on, for example, the city imposed watering restrictions. People’s lawns dried up, power consumption for air conditioning surged and crops withered in the fields. It’s a scenario that gives Aubrey Spear, director of Lubbock’s water utility, plenty to think about. Although the city of 230,000 lacks surface water in its immediate area, it sits atop the Ogallala aquifer, a vast pool of groundwater stretching from Texas to Nebraska. But decades of heavy irrigation for farming – the region produces more than half of the nation’s cotton – has so drastically depleted the resource that Lubbock must pipe drinking water from elsewhere. For decades, the city drew most of its water from Lake Meredith, a reservoir on the Canadian River, 150 miles from Lubbock and 30 miles northeast of Amarillo, with supplemental supplies from two well fields closer by, Spear says. But Lake Meredith has fallen to historically low levels. “This year, for the first time in 40 years, it’s gone,” Spear says. “We’re not using any of it.” Meanwhile, a new pipeline from Lake Alan Henry, 50 miles southeast of Lubbock, won’t be ready until next fall. Given predictions of another dry La Niña this year, “We’re going to take the precaution and go into Stage 2 water restrictions in April,” Spear said. That will reduce permissible yard watering frequency from two days a week down to one, he said. It’s a grim picture, but Spear, who is updating the city’s 2007 water supply plan, describes a “three-legged stool” of measures aimed at providing Lubbock with a sustainable water supply well into the future. They include greater conservation, diversification of water resources and more water reuse. “On the conservation end, over the past decade we’ve been quite effective in educating the public, as well as raising our rates to the point where people think twice before they dump a lot of water on the grass,” Spear says. Ten years ago, the city averaged 230 gallons of water per capita per day, but stringent conservation measures brought that down to 145 gallons in recent years. The usage number jumped amid last summer’s drought to 176 gallons. The quest to diversify water sources inevitably involves the Canadian River Municipal Water Authority, a consortium that includes Lubbock, Amarillo and nine other West Texas communities that was originally formed to build Lake Meredith. The authority recently paid $103 million to Mesa Water Co. (owned by billionaire oilman T. Boone Pickens) for water rights on 211,000 acres of ranchland, mainly in Roberts County. Lubbock’s reported share of the deal was $33.4 million. Lubbock is also studying ways to get greater mileage from water reuse, Spear says. Half of the city’s wastewater is stream-quality discharge, but more work is needed to get other half to that point, he said. Meanwhile, “We have other demands that we don’t want on the potable water supply.” They include nearby power plants that need water for cooling and a rush by energy companies exploring for natural gas who want water for the drilling technique known as hydraulic fracturing, or fracking. Recycled water would help meet those demands, Spear says. But most of the region’s groundwater is devoted to agriculture, Rainwater says. Farmers have been pumping from the aquifer faster than it recharges for decades, he says, in part because they can: Under Texas law, a landowner owns the water under his land outright. Meanwhile, he adds, federal farm policies encourage farmers to operate for short-term profit, rather than conserve the resource for the long haul. “The incentives for the landowners are to use the water up and some time later convert to dry-land uses,” Rainwater says. But that will inevitably lead to long-term changes in the region. “The generation or two after us is likely to see a very different land use than we do,” he said. The process is already under way, as water reserves in some areas shrink to the point of being unusable. The underside of the Ogallala aquifer doesn’t rest on a flat horizontal plane, Rainwater notes. In some areas, the saturated thickness of the aquifer is still 300 feet or more, while in others it’s now less than 20 feet. Once the water is gone, it’s gone for good. With La Niña, a “self-reinforcing feedback loop emerges,” with higher temperatures leading to less rain – which in turn drives temperatures even higher, she says. That will lead to changes in precipitation and temperature extremes. And of course, warmer temperatures will drive demand for more irrigation. In Global Climate Change Impacts in the U.S., a 2009 federally commissioned report Hayhoe helped to compile, it was estimated that the Lubbock area might see 25 percent less springtime precipitation in the waning years of this century if carbon dioxide emissions continue at a high rate. Meanwhile, summertime temperatures could increase by as much as 9 degrees over the same period. As a climate scientist, Hayhoe often encounters resistance from skeptics who deny that climate change is under way (or alternatively deny that humans have played any role in triggering it). As the recent dry spell makes clear, it really doesn’t matter. Michael Haederle is a New Mexico-based writer. He has contributed to Miller-McCune, AARP Bulletin, the Los Angeles Times, People, Tricycle: The Buddhist Review, The Houston Post, Dallas Morning News and many other publications.